On January 1, 2015, Netflix added every season of “Friends” to their streaming services. The long-running NBC sitcom was a big deal when I was growing up in the ’90s, but you see, I was deep in my angsty, teen-age goth phase. I had no interest in these bourgeois, conventional… old people. Now, as a senior citizen by my teenage standards, I’ve really come to enjoy the popular mainstream trends of my youth, in kind-of an ironic way… and isn’t that the most ’90s way to watch things? • You guys, ’90s fashions were rilly, rilly good. I’m so glad they’re coming back into style. • Wait, am I supposed to be sad that the monkey is going to live in a zoo? ‘Cause I’m not, but this music and Ross’ face indicates I should be. • I’m starting to appreciate the harmonies in this opening theme song. • Could Chandler be any funnier? …No, really, I’m asking. • You guys… I’m lonely. • So. Many. Bowling Shirts. • Monica got a hickie from a member of Hootie and the Blowfish… that’s it, I’m out. • So, Ross and Rachel kissed… I guess I’m supposed to be happy? But instead, I just feel bad for Amy. Plus, I don’t get this “OTP” thing from R&R — they have no chemistry. • Also, they fight so much… why am I supposed to be rooting for them? • Oh, Giovanni Ribisi! Where has he been lately? …I am so out of touch. • WAIT, what happened to Chris Isaak as Phoebe’s boyfriend? When did she start dating Charlie Sheen? Also, I really like Tom Selleck as Monica’s boyfriend. • How am I only on season 3? Why are each of these seasons 25 episodes long? Why haven’t we learned from the British when it comes to television series? What’s the plural of series? Serieseseses. 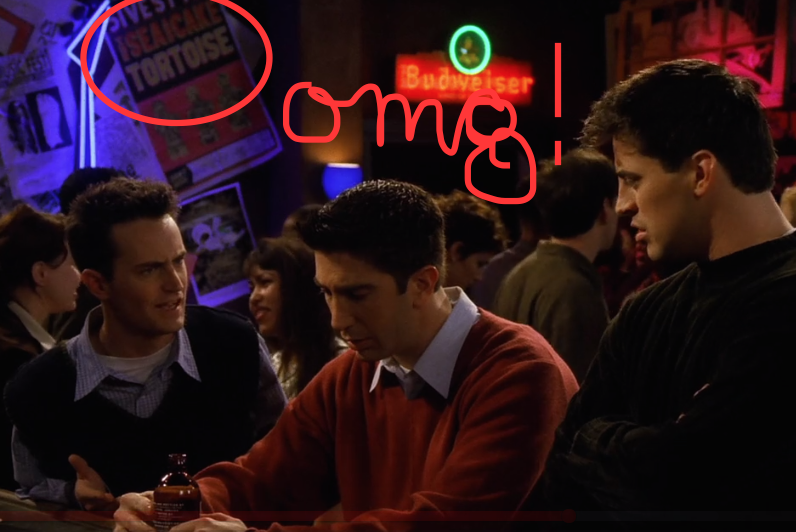 • So, it’s the episode where Rachel and Ross “take a break,” and I’m too distracted by the Tortoise/The Sea & Cake poster in the club where Ross meets the copy store lady. • It’s so wrong hearing a laugh track while a couple is breaking up. 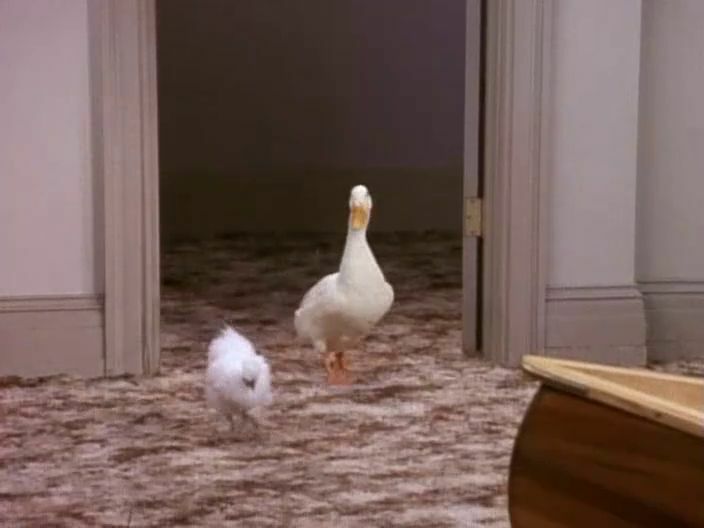 • First a monkey, and now Chandler and Joey have a duck and a baby chick? What is it with this show and quirky animals? Did they do some kind-of focus group that said weird pets are the way to go? • I kinda like that faux Violent Femmes song they use to transition between scenes. – Ew, Monica and Chandler. – Ew, Rachel and Joey. • IT’S NOT OVER?!?!!?!?!?!! My poor neighbors were not prepared to hear the scream I made when Netflix auto-rolled me over into season 9. I really, truly thought Season 8 was the final season. I bet a lot of people wished it had been. • What the hell happened to the chick and duck? Did Animal Control come by somewhere between Seasons 5 and 7? • My neighbors are gonna worry when they don’t hear the familiar song of The Rembrandts every evening. • Final episode… thank god, they explained about the chick and the duck, ’cause that was weighing heavily on my mind.